Yesterday, I got up, got my coffee and sat down to cruise Facebook and Twitter, for anything Google may have changed while I was sleeping. Immediately a video was put up by Eric Enge, who I’ve seen speak many times and has written books on SEO. Great guy and super knowledgeable, so it caught my attention. Enge is definitely a thought leader in the SEO space. And, nine times out of 10 I agree 101 percent with what he says. I don’t comment or write blogs because it would make a bad blog post. It would go like this: Yeah, what he said. But today was very different and I wanted to address it. The video they put up was talking about if there is a direct correlation on SEO rankings and Social Sharing. What is social sharing anyway? Social sharing is what we all do when we see a page we like or find valuable. We hit the button on the website that shares it back to our social media properties, usually Facebook, Twitter, LinkedIn, Google+ and so forth. Now those of you who know me personally know I am a social hoarder. You will never see me share stuff related to my business that other people think, nor will you see politics, or religion either for that matter because in as much as I want you to share my posts, I don’t want to cede the limelight to others who I don’t know, nor do I want you to invalidate my opinion based on your own belief systems. So my social sharing is limited to Dachshunds, who are the funniest breed of dogs on the planet; my deep love for JJ Watt; the QB anarchy of the Houston Texans; the fact that I am proud of being from New Jersey and have a real soft spot for Joe Flacco. So what did Eric Enge say? The video was about how Google cannot use social sharing as a ranking variable and how links are still more valuable than social shares. And in both cases, I completely agree with those two assertions. But I walked away from the video thinking of my small business owners that really should depend on social sharing for a few important reasons, and I didn’t want that to be overlooked, and thus why the post about it. The base premise is that Google does not use social in its algorithm. It cannot see a majority of the social posts from places like Facebook. And even though it has access to Twitter, it’s not using but a fraction of it. Both of those assertions are correct. And it would seem to me that to have social media signals baked directly into its algorithm would be foolish on Google’s part. So far I’m directly in agreement with Eric. So much so that I’m going to take this a step further. Google has no direct control over any of these third-party applications, which in essence is what a social network is. Tomorrow, any one of the giants could change their business model and disrupt the impact their network has. Some of us are old enough to remember know the rise and fall of Justin Timberlake’s social platform, Myspace. Google themselves have a failed attempted at a social network in Google+. And these networks come and go based on trends and fads. Facebook, once for college students now has college students flooding Instagram, with Facebook demographics shifting. Shifting sands does not allow Google to use this data directly into its algorithm and it would be bad business for them to try. 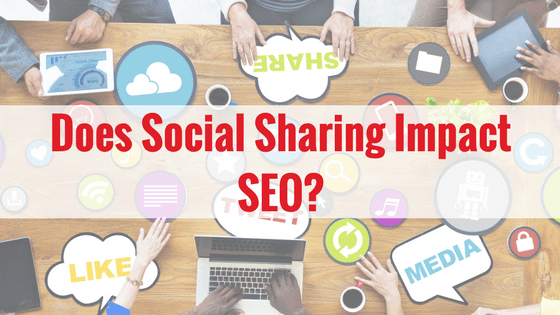 But does social sharing help SEO? This where I split with Stone Temple on their opinion presented in the video. Their take on this topic seemed to be presented as a cause and effect between two unrelated things. Meaning just because A happened, and B happened, there was no interconnection between the two. While I agree, social sharing does not have an absolute direct effect the way a link does, there are many aspects of the present ranking factors that are a way for Google to include signals generated through a robust social media presence in the algorithm, and yet not directly cede control by including them directly into their algorithm. Understanding the hows and whys of this gives small and upstart businesses a place to compete in an ever growing bunch of hoops businesses must jump through to be successful. What do social sharing and a co-signer have in common? Now to understand why I am saying this, a few weeks ago SEMRush put out their list of ranking factors for 2017, with the leading factor being traffic. We all remember at some point in our lives going to the dealership to buy a car only to be turned down for not having credit. We were told to go find a co-signer. Unfortunately, small and upstart businesses now have similar problems. If you don’t have traffic you may not be legitimate enough to give you a ranking that will actually bring you traffic because you have no traffic. It’s a vicious circle. In days gone by you could put up a page of good information, and if you had something important to say, your page would find itself atop the SERPs. For a small or upstart business, it was a great equalizer and allowed them to be on the same playing fields as the far larger brands. But now, with traffic and brand awareness being a large contributing factor, the days of the little guy being able to compete are morphing and small business needs a way to validate itself. Social sharing is the perfect vehicle for this in my opinion whereas it helps traffic, brand, and referrers. Three of the seven factors. So what are traffic, CTR, and referrers? These three metrics are really metrics of engagement and validate that your website is ‘real.’ They are found within Google Analytics. Traffic – How many visitors your website receives. In other words, how popular you are and how many people think what you have to offer is worthwhile, because not only is Google looking at how many people are visiting, they are looking at how long they are staying. If people come and don’t stay, that’s a bad thing. CTR or Click Through Rate – How many times your site is shown in the SERPs and then how many times it is clicked on. If a site shows a lot and no one clicks on it, it can be inferred that it is a bad result. But for a smaller brand, it means that people don’t know who you are, and therefore are skipping over you to someone they know. Referrers – These are the multitudes of websites that send someone to your website. And Google is using the information to judge the site. Now that we understand these three drivers, I want to come back to social media and social sharing. For a small business that needs engagement, which is what these are metrics of, social really boils down to these and can easily be slotted in and used to help drive up the traffic numbers, increase the brand awareness, and therefore drive up the CTR and by appearing across multiple social platforms, it’s a way to increase your referrers, your visibility, and really aid you in getting links. The rest of the SEM Rush variables, a small business site can handle, meaning how many pages do visitors read? Do they bounce immediately back to Google? And how long is your content? These are all things you can control. Come up with a great piece of content (like this one). Post the Great Piece of Content on your website. Create a great graphic (or if you’re brave, a video) that will make people want to click through to your website. Share your content socially (using the graphic or video you made). Go to the Ad Manager of the social network and set up a small ad campaign that will drive traffic to the Great Piece of Content on your website. This is not about boosting for likes. In effect, this will act as a co-signer to help you validate your web site and feed Google some of the data that is part of their algorithm. So, although we can argue that social sharing is an unrelated event and there is no cause and effect, I more think that Social Sharing allows smaller businesses the opportunity to bring some traffic, increase their brand and referrers, thus allowing them to have all the metrics Google is looking for when they choose to rank a page. For my students, this is an example of what I mean when I say don’t share someone else’s something. Read it. Digest it. And write about it. We often get this questions from clients who are considering adding a new product or service to their company that doesn’t fit inside what they presently do. So today I want to take a look at navigating how to decide what to do. There are a lot of factors to consider when launching a new vertical for your brand and how the size and scope of your business may impact this. Each situation should be looked at and assessed on its own merit. The first question I ask is, what are the goals and what are you hoping to accomplish? This often gives me insight as to what recommendations to make. But see, I have a dual vision when I look at a problem. What is the client hoping to accomplish, but also how is Google going to perceive this? And then, how do you balance these two things? The natural progression in the conversation usually comes around to why should Google care? The answer is pretty simple. This can easily be perceived is trying to game Google’s system or trying to mislead them to gain larger traffic or market shares using their search engine. If you are only having two websites to gain market share, with no speakable difference in the two sites, then you should not have two sites. Google’s organic algorithm is designed to rank the most relevant website on any given term. So sometimes when trying to address this new vertical, it could be perceived that you are setting up a site to ‘game’ Google’s system. And Google does not take too kindly to that. In the SEO world, you will hear a lot of discussion on the utilization of microsites and why they work. It’s a very pedestrian and rudimentary approach. And its probably past its shelf-life in terms of effectiveness. No matter, I still hear people discuss this and therefore I believe Google has a hypersensitivity to why this second site exists. So here are a few honest scenarios we run in to. Scenario 1: I have a top ranking, focused, relevant website that is focused on Family Law and I want to now open a secondary product line that talks about corporate tax law. Well the only things those two things have in common is the word law. Aesthetically those are two different client types. The words surrounding each of those terms are different. So If I wanted to add tax law I may do a risk analysis and decide that I need a separate stand-alone site to address the needs of those clients and not dilute my primary business, which may impact it negatively. Additionally, there is the who is going to hire a Family Law person to do Tax Law or vice versa? Considering you have about eight seconds for people to decide if they are staying on your site, diluted messaging would not work well. I like to think in terms of what people know, so this would be like Taco Bell and KFC. Both owned by Yum Brands but marketing in two very different ways to two very different audiences. Scenario 2: I have two unrelated topics, for example, I have a tax preparation business and I own a print shop. Those two things share nothing and therefore two sites are fine. And there is not much more discussion needed on that. Senerio 3: I have a product that services two different markets, let’s say oilfield and aerospace. And this is where this can get very tricky to do it right. So, a large corporation that services multiple industries can put this on one website and do just fine with it. And in fact, most businesses would do just fine with it if you silo the material properly and use your brand as the umbrella. Take for example Trelleborg, their website makes sense. Google understands it and it is set up properly for that. Mostly because it was set up as an industry specific site, with Trelloborg being the common thread between them all. So what about a smaller company whose website was not set up around the industries they serve, but rather the products they sell? Because those silos are not built out and because the site ranks very well under the product side of the business, there may be a short-term negative implication from just adding them on to the site. 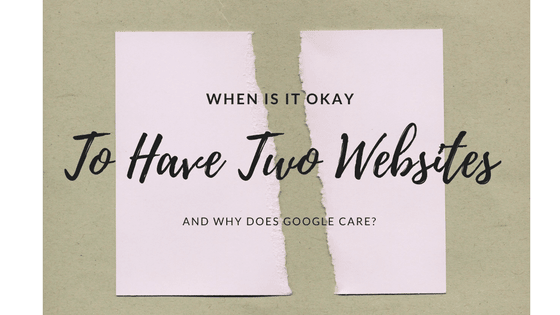 If they are two separate companies, with two separate addresses, separate corporate structures and different attributes like separate phones, we are well within our bounds to have two separate sites and allow them to operate as two different entities. It would also be assumed that they would have two separate product offerings and would not be piggybacking one off the other. Once you determine you do need two websites, you must stay above board. The natural inclination would be to cannibalize keywords or try to make the product offering the same on both sites thinking you will get a bigger market share. But this is where this starts leaning towards stepping over Googles guidelines as well. If you felt these two businesses needed to be different and have different websites, there should be no inclination to blend them back. Resist the temptation. Products, content and approach must be unique for both sites or you risk damage to one or both of the sites in the SERPs. There would be places that you may compete, but overall they should remain different. Understand that each site will have to be cultivated independently. Separate content, links, social and engagement. If you don’t have a clear path or resources and aren’t willing to do all that is entailed, add your new product or services to the main site as long as there is a relationship between the items. In other words, don’t add Veggies to a Shoe site.